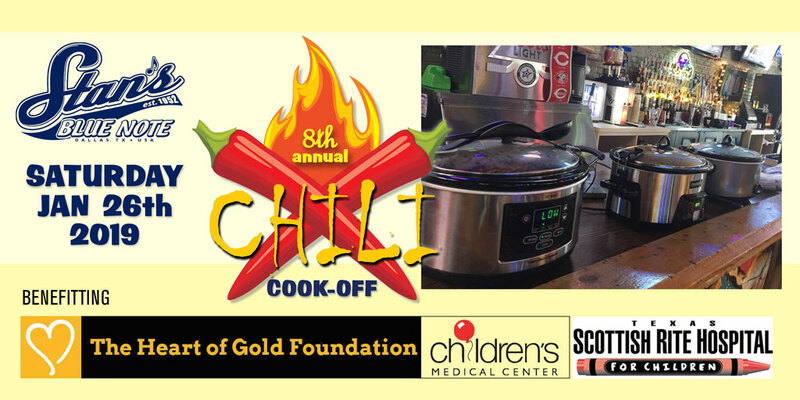 We’re hosting out 8th Annual Chili Cook-Off from 4 to 7 p.m. Saturday, January 26. Entry forms are available now at the bar; the cost is only $10 per entry (or $20 per entry the day of the event). Stan’s Blue Note will donate a portion of the proceeds to Children’s Medical Center, Scottish Rite Hospital and the Heart of Gold Foundation. Volunteers and judges are welcome; five dollars gets you a spoon and a ballot! People’s Choice judging will begin at 4 p.m. Winners will be announced by 7. There will be two categories of chili this year: Texas Chili, with no beans, rice, or pasta; and Anything Goes Chili, which may include beans, fillers, or vegetarian fare. Contestants must prepare their chili at home and arrive between 2:30 and 3:45 p.m. with a serving spoon and their entry in a crock pot or warming dish. Chili entries will be assigned a number and sent to a judging area at 4 p.m. Cash prizes will be awarded after winners are accounced. Stan’s encourages everyone to come out for a day of good food and good fun for a good cause. Enjoy Stan’s newly remodeled back patio, complete with a wooden arbor and outdoor TVs. There will be more than 50 beers on tap, 30 big screens playing non-stop sports action, an updated menu featuring made-from-scratch recipes, dartboards, a pool table, shuffleboard, music – and of course some of the best chili around.